On behalf of the Board of Management, staff, parents and pupils, I warmly welcome you to our school website. We are a Catholic primary school with a special unit for children with autism. We continually strive to provide a caring, happy and secure learning environment, where the intellectual, spiritual, physical, moral and cultural needs of our pupils are identified and addressed.. There is also a wonderful sense of community evident in our school and it is the vitality of staff and students and the support of parents that makes Scoil Bhríde Kilcullen truly unique. I hope you enjoy learning about our school and are encouraged to continue visiting both our school and our website. We made butter from cream in Science. We poured the cream into a clean lunch box. Everyone shook the cream until it changed into butter. We put the butter on some crackers. It was very tasty! Look at our pictures that we took with the Ipad. On Sunday 7th April Anna, Sean, Myles and Luke will be going to the All Ireland Credit Unions Quiz. They have been practicing a lot lately and are hoping to win. They are very excited to be representing our school and are feeling very confident. They would like to thank Mr. O'Raoghaill, Mr. Donovan and Mr. Hanafin for their help. 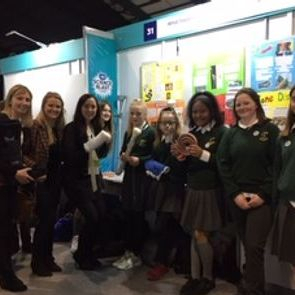 The children in Ms. O'Keeffe's 6th Class took part in Science Blast in the RDS on March 7th. They presented their projects along with over 100 other schools from around the country. They focused their project research around bones - bones in people/animals, bone diseases, ways of curing bone cancer in the future, breaking bones, types of casts, exercises that are good for bones, food sources that are healthy or unhealthy for bones etc. They carried out surveys in the school to find out how many children had broken a bone, what was the most common broken bone. They also attended exhibitions showing very cool Science experiments and learned lots of new Science facts! Mr Elliffe's 5th class helped Mr McConigley's Senior Infants take pictures of life on An Tearmann Farm. The children used our new Ipads to take pictures of calves, sheep, flowers, trees, geese, turkeys and pigs. Senior Infants told 5th class all about the plants and animals. Check out our pictures below. Who doesn't love a good old fashioned game of marbles? Ms Carney's class certainly enjoy it! The First class students are learning about the life cycle of a frog in Geography and a parent kindly brought in some frog spawn for all the children to watch and investigate. Classes from all over the school have been visiting our little friends and this week, you can see the little tadpoles swimming happily in the water. And don't worry, we are looking after them very well...we have a professor of biology and environmental science advising us on how to care for them and we will ensure to return them to their natural habitat. As the Kilcullen celebrations continue, Scoil Bhríde held a quiz with schools from around the county to celebrate this event with our neighbouring schools. Children and their teachers came from Caragh, Kill, Ballymany, Gaelscoil Chill Dara, Scoil Phádraig Athy, Scoil Mhichil Naofa Athy, Ballysax and Milltown to name a few. This was a very enjoyable occasion and enabled everyone to learn a little bit about our town. It was lovely to host this event and to invite everyone to our lovely new school and beautiful town. After you brush, spit out the toothpaste from your mouth – but don’t rinse it! Brush before eating in the morning and last thing at night before bed for two minutes. Limit the amount of sugary and acidic food you eat - they are not good for your teeth! Congratulations to our bright and wonderful team who had great success at the Cumann na Mbunscol quiz recently. They were top of the class and finished in second place after completing the tiebreaker. This is a fantastic achievement for our quiz team as they worked hard and spent many lunch breaks practising with Mr O Raoghaill and Mr Hanafin. It is also Noah's first trophy...so enjoy it....you deserve it! Our Fourth class students recently learned about length and had lots of fun on a length trail which involved measuring items around the school. Here you can see Alannah measuring the length of the boys and the girls using the trundle wheel. Ms Power also took us in small groups and we measured the length of the school, the playground, the height of the basketball ring and our own height. We also used Google Maps on the iPads and calculated the distance and the cost of a journey to Galway, Cork and Kilkenny....where all our teachers are from! This year, the Theme for Safer Internet Day is “Together for a Better Internet“. Safer Internet Day 2019 will be celebrated on Tuesday, February 5th. Over 100,000 young people across Ireland joined the celebrations last year. Congratulations to our very clever Under 13 and Under 11 teams at the recent District meeting in Kildare Education Centre, Both teams represented themselves, their families and their school very well and we are very proud of their achievements. Both teams had success on the day with our Under 13 team finishing in second place, just two points away from first place in that division. Our Under 11 team finished in first place and will represent this district and the next round. Details of this meeting are TBC. Congratulations and thanks also go to Mr O' Raoghaill, Mr Donovan and Mr Hanafin. The first class children had a very enjoyable adventure at St. Brigid's Well to celebrate St Brigid's Day last Friday. We looked for signs of spring on own walk through the valley. There were a few buds on the trees and some daffodils stalks poking through the ground. We loved the scavenger hunt and we did some practical maths by measuring the raised platform with a metre stick. Ms. Power told us about the healing traditions associated with Holy Wells in Ireland. We also tested the PH and temperature of the well and decided that it was unsafe to drink as there were too many items on the filter paper. It was a really cold but fun trip to the well. Grandparent’s Day took place on the 30th of January and the children in second class were visibly excited and eagerly hoped to catch a glimpse of their grandparents as they gathered in the senior hall. This is always a very special event and people travelled from near and far to celebrate the special relationship between grandparents and their grandchildren as part of the Catholic Schools Week celebrations. Fr Harte opened the ceremony with prayers, songs and readings and the choir lifted the roof with their fantastic singing. Some grandparents then recalled memories of their own First Communion and some even showed us pictures of their special day. Indeed the resemblance between the children and their grandparents was very obvious in some pictures! It was lovely to sit and listen to stories that never grow old about life in our grandparent’s time. 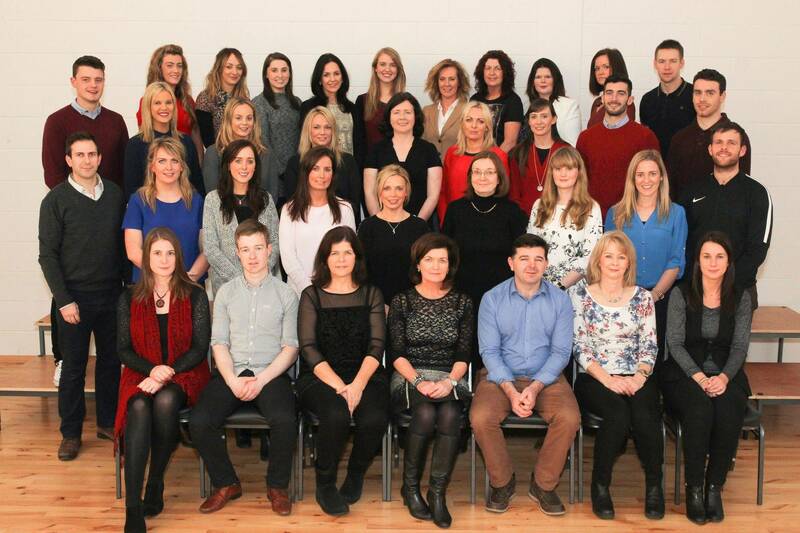 A special word of thanks to all those that were able to join us in Scoil Bhríde for this lovely occasion. Blast off in Senior Infants! Here are some of our senior infants having great fun designing and building balloon rockets. Confirmation – Tuesday 5th March 2019 - 11.00 a.m.
Ceremony of Light - 12th February 2019 – 7.15 p.m.
Thurs 4th April 2019 – 1.15 p.m.
10.00 a.m. & 12.30 p.m.
(Provisional) - 25th June 2019. As a parent, you are your child’s first teacher. Your home is a place where lots of learning is happening every day. Your most important job when it comes to your child’s learning is to show interest and get involved. You make a difference every day when you talk to and listen to your child. The Department of Education and Skills have designed a website called www.helpmykidlearn.ie which highlights the way people of all ages learn as part of their everyday lives and especially the positive things that children learn at home from their families. By speaking and listening to your child, by talking and reading to them, by pointing out words and notices at home or out and about, you have introduced your child to the world of language – spoken and written. Through playing with your child, they learn new words, and learn to think and to talk about their thoughts or feelings. The website is for parents of children aged 0 – 12 years, from birth to the end of primary school and is divided into five age categories (0-2, 3-4, 5-7, 8-9 and 10-12). It is designed to support parents with fun activities and tips according to their child’s age. There are lots of ideas for helping children with talking, playing, reading, writing and using numbers. Since your child was born you have been teaching them to learn about the world. We hope you find the website useful as you continue to help them learn and develop. Zeeko.ie is a great website for supporting children's online wellbeing. Click here or on the Zeeko icon above for some top tips on helping your children stay safe online over the summer. Our Ceremony of Light took place on Tuesday 13th of February and involved our sixth class students that are making their confirmation this year. This enjoyable service was a key part of preparing for Confirmation. Parents passed the lighted Baptismal candle to their child as a sign that they are willing to hand on their faith to their child. The Confirmation ceremony will take place on March 8th at 12pm. There are further resources available on our Promoting Friendship page. This includes the most up-to-date Internet Safety Guide from ZEEKO which empowers children to protect themselves through education. Dr Marina Everri, Head of Research at Zeeko recommends that children’s VIRTUAL WORLD FRIENDS are their REAL WORLD FRIENDS: Children should only connect with people they know in the real world first e.g. brother, sister, someone from school, where they live etc. Parents should discuss with their children who they are connected with online. Parents should become curious of what their children do and what their children’s interests are. Parents will never know everything. It is important to respect children’s privacy because this supports a reciprocal trust. Take the opportunity to engage in discussions with your children starting from the hints/ ideas they tell you. MORE BOYS THAN GIRLS speak with strangers online, 27% of boys vs 11% of girls. THE ISSUE IS BIGGER THAN SMART PHONES: A large proportion of children are speaking with strangers online with a device other than a smart phone. 43% do not use a Smart Phone to speak with a stranger online. Smart phones, iPods and Tablets have the same capability and the same risk. MINORITY OF CHILDREN DO NOT SEE THE RISK: 27% of Primary school children think it is ‘not serious at all’ or ‘kind of serious’ to talk to a stranger online. MORE OLDER THAN YOUNGER CHILDREN speak with strangers online, 27% of 6th class vs 12% of 2nd class. VERY SMALL USAGE OF KIK: 2 out of 7,763 Primary school children reported using KIK. The Board of Management of Scoil Bhríde reviewed the school's Child Safeguarding Statement on February 18th 2019. It is available to view both on the school website (Link here) and in the school on request.